In every issue, book review editor Mark McInroy supplies notes on books recently released in theology and the arts. He is an assistant professor of systematic theology at the University of St. Thomas, and has published academic examinations of Origen of Alexandria, Martin Luther, Karl Barth, Karl Rahner, and Hans Urs von Balthasar. He is the author of Balthasar on the Spiritual Senses: Perceiving Splendour (Oxford University Press, 2014), and was a 2015 recipient of the prestigious Manfred Lautenschlaeger Award for Theological Promise. Paul Crowther, How Pictures Complete Us: The Beautiful, the Sublime, and the Divine(Stanford: Stanford University Press, 2016). recent studies in theological aesthetics that, to Crowther’s mind, preach to the converted, the author seeks to establish the aesthetic transcendence of which pictorial art is capable on metaphysical grounds that are independent of any system of faith. In Chapter 1, “Ideal Beauty and Classic Art: A Philosophical Vindication,” Crowther acknowledges that the classical ideal of beauty can no longer occupy the privileged position it once enjoyed. However, he holds as a viable option the notion that the ideal beauty portrayed in classical art can effect transcendence through “geometrical immanence,” by which he means the presence of geometrical solids (spheres, cones, pyramids, etc.) in pictorial art. Such structures, to Crowther, “are basic elements from which the fabric of spatial appearance itself is composed” (23). When depicted in pictorial art, these structures convey universal features of the world in concrete, particular forms. This palpable reciprocity between the concrete and the universal not only elicits pleasure when beheld, this balance also effects transcendence. Chapter 2, “Pictorial Art and Metaphysical Beauty,” begins with a telling distinction between pictorial art and photography: whereas photography captures a particular moment in time and space, pictorial art actually creates space and time on the artist’s own terms, if you will, thereby setting the picture apart. Pictorial art, then, effects an “idealized immobility” that Crowther terms “presentness” (40). Additionally, through the use of linear perspective in particular, pictorial art is able to present space systematically, as capable of exploration from an endless variety of potential vantage points. From here Crowther makes the intriguing remark that, inasmuch as human beings do not simply behold space from a place beyond it, but instead are always in the very midst of the space they perceive, pictorial art, which functions similarly, is “an emblem of consciousness” and, when “understood as systematically spatial, it is also an emblem of divine consciousness—an exemplar of the sensuous divine” (49). Crowther elaborates on his provocative phrase by saying that in systematic spatialization “we have an image that projects an ideal system of spatial knowledge whose linkage of the individual viewpoint in systematic reciprocity with the others can be interpreted as an image of God’s own cognitive acts and their transparency to one another in his omniscience. It exemplifies the sensuous divine” (51). Chapter 4, “Color-Field Abstraction and the Mystical Sublime,” takes up abstract art, which might at first glance seem not to serve Crowther’s thesis that pictorial art allows one to see as the artist sees. However, Crowther postulates that abstract art, such as that of Mark Rothko, invites one into “transperceptual space,” which Crowther discusses as “hidden or unnoticed visual details, textures, and relations, as well as alternative possible perceptual or imaginative viewpoints on them, that are the ‘stuff’ from which the world of recognizable visual three-dimensional objects is emergent” (81). In this regard, abstract art could be said to allude to a deeper level of the structure of things than the ideal beauty discussed in Chapter 1. Through this provocation, Crowther holds that we can experience the “mystical sublime,” which is distinguished from other forms of the sublime by its “negative aspect,” the inscrutability of the realities it conveys. Abstract art, then, “offer[s] a phenomenal experience wherein the overwhelming uncertainties of ultimate reality are expressively comprehended through a specific mode of art practice” (105). Chapter 5, “Holistic Beauty at the Limits of Art: Photocollage, Painting, and Digital Imagery,” sets forth a notion that “semipictorial” genres such as photocollage actually succeed in delivering “aesthetic completeness through crossing boundaries between visual media” (107). This is so, to Crowther, because such art reconstitutes fragments of experience such that “holistic beauty” can be enjoyed by the viewer. In Chapter 6, “Perspective and Icon: Jean-Luc Marion’s Theology of Painting,” Crowther takes issue with Marion’s view of painting, in particular his claim that painting is “absolutely original.” To Crowther, Marion’s assertion erroneously ascribes originality to the psychology of the artist, not (as one might expect) to previous works by the artist and others. Additionally, Crowther insists that Marion too eagerly leaps from a painting’s ability to evoke the “infinite” to the painting having necessarily religious import. To Crowther, the infinite and the religious must be distinguished. Last, Crowther finds Marion’s account of the icon authoritarian rather than reciprocal in that it commands submission to the ‘prototype’ of which it is an icon. Chapter 7, “Metaphysics and Theology of Pictorial Art,” attempts to offer a rationale where it is lacking in Marion, namely in claiming that there is religious significance to the metaphysics suggested by pictorial art. Crowther begins with the notion of “iconic projection,” which in a manner similar to that described in Chapter 2 insists that art “articulates space across the horizon of time” in that past, present, and future can all be depicted (146). For this process to be completed, the iconic projection must be actualized through a physical medium, such as pictorial art. When this occurs, the picture “presents possibility at the same ontological level as the very criterion of something’s existing—namely, spatial extension” (147). Additionally, the artist who performs this work exercises a freedom that transcends any plodding rule-following, and to Crowther such creativity underscores the artist’s ability to transcend nature. In fact, as a component of his final step toward making theological affirmations, Crowther holds that in this freedom the artist can be seen as “an image of God’s being as the opener of time” (152). Matthew L. Potts, Cormac McCarthy and the Signs of Sacrament: Literature, Theology, and the Moral of Stories (New York: Bloomsbury Academic, 2015). Matthew L. Potts attempts in Cormac McCarthy and the Signs of Sacrament to treat a surprisingly understudied aspect of McCarthy’s fiction, namely, his use of sacramental imagery in his novels. Potts, however, is eager to distinguish his approach from religious interpretations that, to his mind, too comfortably identify McCarthy’s outlook with that of Christian theology. To him, “these readings not only oversimplify McCarthy. I believe they also present overly reductive readings of the Christian theological tradition itself” (4). Instead, Potts describes his approach as follows: “I will argue that the use of religious, sacramental imagery in McCarthy’s work serves precisely to undermine structured systems of meaning, and thus complicates what we might too uncritically recognize as ‘religious’” (4-5). Chapter 1, “Knowledge,” notes the failure of religious practices, spaces, and symbols to protect victims from violence in Blood Meridian and No Country for Old Men. To Potts, the monstrous figures of Judge Holden and Anton Chigurh embody an (atypical species of) instrumental Enlightenment reason that exercises unrivaled agency throughout the worlds they inhabit. After describing a black mass of sorts during which Holden leads his men to combine bat guano, sulphur, and charcoal with their own urine in order ultimately to make gunpowder, Potts makes clear “The mass is a miracle of science, not religion; the Judge has transubstantiated knowledge into power and employed it as violence upon his enemies” (46). It is reason, not religion, that ostensibly has power in these narratives. And yet, in Chapter 2, “Fate,” Potts complicates his analysis by exploring the affinities Holden and Chigurh might have with Nietzsche’s Zarathustra. Ultimately, he argues that Holden and Chigurh “fail to valorize and celebrate life in the manner Nietzsche’s Zarathustra appears to demand”(15), and he sees McCarthy (with Nietzsche) as rejecting the “ascetic ideal” that valorizes transcendence of the world. Using Theodore Adorno and Hannah Arendt, Potts connects this rejection of nihilism with aspects of sacramental theology, which find the decisive locus of value and action in the midst of this world, not in a transcendent realm. Chapter 3, “Action,” turns to Suttree, McCarthy’s lengthiest and most neglected novel, in order to examine, among other things, the way in which the tortured main character tries to achieve self-understanding. For much of the novel, Suttree’s search for himself through isolation is wrongheaded according to Potts’s Arendtian analysis; for Hannah Arendt we discover ourselves through self-communication. To this assessment, Potts adds Adriana Caravero’s extension of Arendt, specifically her claim that “‘Being and appearing coincide . . . [that] appearing is indeed not the superficial phenomenon of a more intimate and true essence. Appearing is the whole of being’” (99). Our histories, then, the deeds we have done are the way in which who we are—without remainder—is exposed. (Potts intriguingly calls his reader’s attention to Augustine, for whom a sacrament is “a visible word that does what it says” .) To Potts, then, “Suttree’s crisis of identity is, in truth, a crisis of sociality. He cannot be reconciled to himself because he is inadequately exposed, vulnerable, exhibited to others” (102). However, toward the end of the novel, Suttree experiences an unexpected peace. As one might expect from the above analysis, this tranquility is achieved through outward action in the world, specifically corporal works of mercy. Although Suttree’s attitude toward these deeds stand in some tension with his derision for his own flesh and the countless ways in which he fails others, it nevertheless indicates a high regard for materiality and action, and this has far-reaching consequences concerning the question of how “religious” McCarthy’s works are. “In ultimately discovering his identity precisely in the corporal works that constitute his identity in McAnally, Suttree in fact develops an extended critique of the Gnostic impulse in Christianity. . . . By eventually discerning something like holiness in the material world about him, . . . Suttree’s final resolution embraces a theme one might reasonably declare largely congruent with the Christian theologies of incarnation and sacrament” (107). Chapter 4, “Story,” examines McCarthy’s border trilogy (All the Pretty Horses, The Crossing, and Cities of the Plain), and here Potts argues that the narrative presented in these novels serves as a foundation (“loose” and “shifting” though it may be) for ethics. Throughout the three novels, McCarthy portrays characters who tell intricate, evocative stories, and who also reflect on narrative itself. To Potts, story is an important way in which the “externalizing” of the self he describes in Chapter 3 occurs. Despite the fact that McCarthy himself often tells stories that are “fraught with background,” to use Erich Auerbach’s phrase, for characters such as Billy Parham, story functions as a confession of sorts in which he becomes dangerously exposed, dispossessed of himself. The final scene of Cities of the Plain has Billy telling his sad life’s story to Betty, who receives his words and attends to his needs. “Here is the risk and vulnerability [that] establish[es] in this instance an ethic of accountability. . . . Despite the bleak and tragic fatalism that drives so much of the plot and theme of this trilogy, once again McCarthy concludes this work with a moment of tenderness, a fleeting scene of grace that worries all the fatal certainty he has taken such elaborate and poignant pains to render” (150). Chapter 5, “Sacrament,” adds McCarthy’s The Road to the novels Potts considers, and he begins the chapter with a helpful summary of his view of sacrament. He reminds us “that the sacraments are acts which effect a reality, that they are what they say and do; that the sacraments do not displace the ordinary in making room for the holy, but that they consecrate the ordinary precisely as ordinary and sanctify the everyday; and that the sacraments upend all notions of glory, that the movement of their signification coheres with the horror of the cross” (151). Potts conveys two “diptychs” of horror and tenderness in the novel: first, the unnamed man and boy bathe in a pool underneath a waterfall; shortly thereafter the man has to shoot an assailant as the perpetrator holds the boy, splattering the boy with brain and tissue. Second, the man and boy discover an underground cellar filled with amputees who are slowly being eaten by their captors; following this gruesome revelation, the man and boy discover another cellar, this time one filled with food by people who either died or abandoned their stores. To Potts, the sacramental significance of these events is clear: “that bath and that meal are not signs of life, or not just signs of life: these acts themselves bear all the fullness of life. . . . The acts themselves—lifting your child above the ruins, hugging your child under a waterfall, feeding your child a buttered biscuit—they themselves justify all the risks they entail” (172-173). Just as sacraments do not point beyond themselves to something more (beyond the world), but are the very reality they signify (within the world), these moments in themselves fully celebrate the love of the man for his son. Potts deftly balances exposition of McCarthy’s novels and analysis of those narratives, and he brings a sophisticated set of hermeneutical tools to McCarthy’s texts. The result is an engaging study from which both the newcomer to McCarthy and the reader familiar with his fiction can learn a great deal. 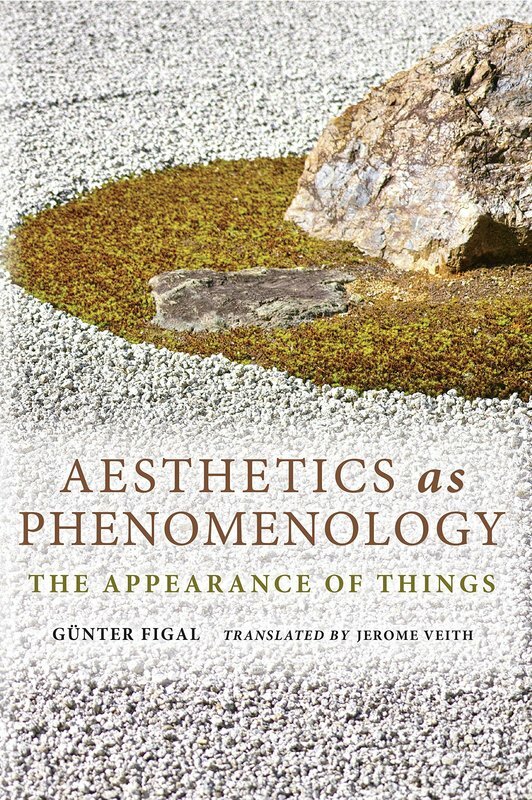 Günther Figal, Aesthetics as Phenomenology: The Appearance of Things, trans. Jerome Veith (Bloomington: Indiana University Press, 2015). ​Accordingly, aesthetics essentially is phenomenology” (3). Artworks, then, are at root “appearing things” (Erscheinungsdinge). Figal unfolds the meaning of this claim in four steps, each of which takes a chapter of his study. “accompanying notions” that enrich the concept. By contrast, Figal regards artworks as inherently decentered, and the accompanying notions to him are the very artwork itself. “An artwork is not an ensemble of ‘accompanying notions’ organized around one or several concepts, but instead an autonomous decentered order” (60). As such, the character of the artwork’s appearing is the only way to treat its order. Figal maintains that this appearing necessarily occurs through forms of art, and Chapter 3, “Art Forms,” takes up the task of treating these forms. One would not be mistaken in regarding this chapter as extending the decentering impulse of Chapter 2, as Figal explores the ways in which image, poetic text, and music all relate to one another, so much so that one cannot fully separate them from each other. To choose one of Figal’s examples, “An opera is just as much a musical as a literary work, which in its stage production also gains imagistic moments” (97). Figal argues that attempts to get behind genre to the essence of art by figures such as Kant, Hegel, Nietzsche, and Heidegger all rely on an individual art form, and as a result they offer ultimately reductive accounts of art. To Figal, by contrast, “a true artwork is only a work by virtue of the mixture of art forms; this mixture is itself in each case an individually actualized decentered order” (137). To this definition of true art, Figal interestingly adds, “an artwork is all the more beautiful the more intimate the connection of art forms is within it” (137). From here Figal turns in Chapter 4, “Nature,” to a discussion of artworks’ functioning as a locus within which the natural shows itself as a “primordial appearance.” For this to occur, however, one must first understand with Cézanne that art requires a lack of intention for its success. Figal observes that the conversations between Cézanne and Joachim Gasquet articulate a conception of the artist as a passive receiver who tables his or her own priorities in order to let the object of his or her art be revealed on its own terms. The artist “must retreat completely, his will must become mute, and all prejudicial voices in him must be silenced. The painter must . . . become a complete echo. Then the whole landscape will inscribe itself on his sensitive photographic plate” (168-169). Figal productively mines the treatment of Cézanne’s art by Maurice Merleau-Ponty, who holds that Cézanne has severed “‘the spontaneous order of things from the human order of ideas and the sciences,’” and has thereby succeeded in painting the “primordial world,” a world before concepts, science, and use (169). Chapter 5, “Space,” develops the notion that, in order for art to disclose a world, something else needs to recede; an examination of this interaction requires a treatment of space. Figal reminds his reader with approval of Heidegger’s resistance to the Cartesian notion of space as extension, but he ultimately holds that Heidegger fails to differentiate space and thing (188). Figal uses the example of Frank Lloyd Wright’s Fallingwater to claim that, although the thing (the building) is indeed allowed to have its effect on the viewer through the place in which it stands, the place is not reducible to the building that stands on it. The two can and must be differentiated from one another. They are, of course, related in an intimate way, which Figal conveys as follows: “A place is only ever capable of being designated as such if it is a place for something. . . . This standing-back that allows something other to come into effect is the release that is essential to the place. Places, one might say, are the phenomenally giving, while that which shows itself in a place is the phenomenally given” (189). Although his (translated) prose is arduous at times, Figal’s study rewards effort. Readers familiar with philosophical aesthetics and philosophy of art will find their understandings of those fields both challenged and deepened, and Figal’s attempt to look at art as art will be welcomed by many.